Garuda (Skt. garuḍa; Tib. ཁྱུང་, khyung, Wyl. khyung) – a mythical bird-like creature which features in both Buddhist and Hindu lore. They also symbolize various elements of the Buddhist path. On the outer level, the garuda is a mythical semi-divine bird-like creature that is the enemy of the nagas. It is represented in both Hindu and Buddhist traditions (especially in Tibetan, Cham, Khmer and Javan art). They appear in many tales recounting the Buddha's previous lives, and are said to pay homage to the Buddha. In the Tibetan Vajrayana tradition, the garuda was associated with the khyung, which are important deities of the Bön pantheon, and practised during healing rituals in order to counter certain illnesses provoked by nagas. 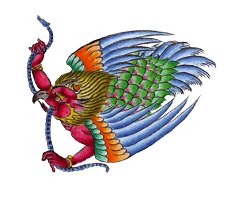 The garuda is also one of the four dignities associated with the windhorse. In this context, the garuda represents the fire element, and it is said to to symbolize freedom from hopes and fears. The practice of Takhyung Barwa combines the practices of Hayagriva, Guru Drakpo, and Garuda. ↑ The Tibetan Book of Living and Dying, page 109. This page was last edited on 9 November 2018, at 06:08.